Arriving from Atlanta, the Jets 2.0 had limited prospect depth and not enough NHL-quality players to fill out a lineup card. The major questions facing the franchise followed from those deficiencies – where can we find more NHL-quality players, and how can we make that pipeline sustainable? For GM Kevin Cheveldayoff, the answer to both is the draft. Last year we took a look at the Jets’ organizational depth chart, sussing out the top prospects likely to make an NHL impact from the long shots and the falling suspects. Having graduated Mark Scheifele and Jacob Trouba from last year’s crop of Blue Chip prospects while in the same year finishing last in the Central Division in both Wins and Points, there’s a fair argument that the ‘Cheveldayoff Method’ is faulty. But with just three years on the job and the rookies making an impact, patience is still required. Inside we’ll examine who the next generation of Jets might be with an eye to both the future and the present roster. We start with the team’s Top Prospects. Josh Morrissey: Left shooting, puck moving defender with high-end skating and elite hockey sense. Was a late cut from training camp last year after surprising with his apparent pro-readiness. Nic Petan: A blog favourite for having a brain bigger than his torso. Sees and controls the ice like few players his age, and managed 1.74 points per game over this last two WHL seasons. Creative and deadly in the offensive zone, aware and responsible elsewhere. A Derek Roy-with-Buffalo in the making. Nik Ehlers: Electrifying offence from superb skating and slick hands. A confounded season on a stacked team possibly left him under-valued on draft day. These prospects could become NHL regulars, but have higher risk or lower ceilings. Eric Comrie: Improving numbers year-over-year in the WHL, the reflex goalie is known for his strong reads. Has struggled when the pace has increased in the WHL playoffs and in limited action for the IceCaps. Andrew Copp: Copp was drafted with a limited resume in the 4th round. Since moving up the lineup at Michigan half-way through his Freshman year, he’s put up 48 points in 55 games, and brought size, aggression, and consistency to the American U20 squad. Connor Hellebuyck: Turned pro after two stunning years in the NCAA. Huge bodied, calm netminder with high-end potential. Only his pedigree and limited resume hold him back from blue-chip status. We’ll know more after his first pro season. Michael Hutchinson: Came over from the Boston system to play in the ECHL, Hutch eventually stole the net in St John’s and led the IceCaps to a Calder Cup appearance. Large, calm, good feet – his rookie season comes at 24 with a known problem ahead of him in the depth chart and a train of younger prospects behind him. Brendan Kichton: A former 5th (NYI, 2011) and 7th (WPG, 2013) round selection, Kichton was the top defender on the IceCaps as a rookie pro and managed 48 points in the regular season and another 7 en-route to the Calder Cup. Size and physicality are the question marks, but he played in all situations for the Spokane Chiefs, beat Morgan Reilly for WHL Defenceman of the Year honours in 2012 and scored 240 points in 206 games to close out his time in Juniors. An AHL All-Rookie Team nod this past year might be a step along the way to a fruitful NHL career in spite of his pedigree. Scott Kosmachuk: An absolute barn-burner of a draft+2 season, the former 3rd rounder has speed, skill, and grit enough to be a serious contender for an NHL top-6 in the future. Building a Jordan Eberle-type resume, with the same lingering questions about moving his game to the pro stage. JC Lipon: Undrafted out of Bantam, passed over twice in the NHL draft, the kid just doesn’t know how to quit. An under-sized, over-aged, late round draftee, Lipon is a team-first pest who put up 41 points in his first pro season. A fan-favourite everywhere and a dark house for the Jets’ current roster that can’t be ignored. Adam Lowry: Listed as a blue-chip prospect on this list after his WHL MVP season. The huge forward struggled early in the AHL (5 points by Christmas) but came on strong with 28 points in his final 43 games. Scores more as a winger, organization seems determined to make him a centre. *We are using Calder eligibility, so players like O’Dell and Cormier are excluded from the depth chart. Last year, I offered 12 names for the top of the pile. The team graduated two and let Zach Redmond walk and yet comes back with 11 players in their top group. Typically, it might speak to a strong draft (Ehlers qualifies as that) or general sustainability of the prospect system, but in the Jets’ case, they had some good fortune. Scott Kosmachuk and Andrew Copp both moved from fringe prospects to legitimate ones with excellent seasons in 2013/14. Both players still have a lot to prove at the pro levels – Kosmachuk has to overcome size and strength concerns, while Copp has to show he can deliver offence when he’s no longer the strongest guy on the ice. Meanwhile, the team has three possible options for just one net, all of them log-jammed behind ‘Cheveldayoff Hill’ (i.e. Pavelec and the contract this GM has chosen to die on). 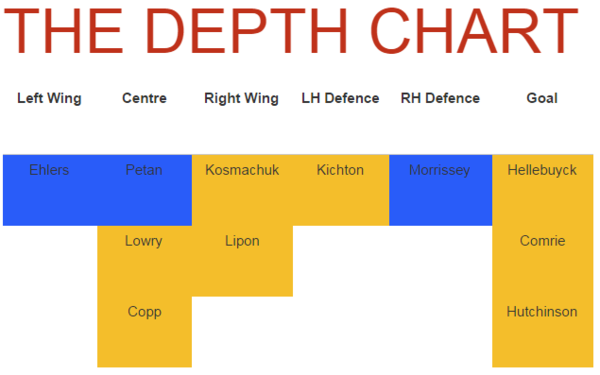 The organization seems to have a Scheifele – Petan – Lowry depth chart planned down the middle for the long-term future. One wonders if Lowry couldn’t make the leap to the NHL sooner as a winger, as the team desperately needs his range, size, and offence from the wing as soon as three years ago. We could argue it’s better for the player’s long-term development to stay at centre in a slightly less scrutinized league, but with Little on the books for four more seasons and the new hire Perreault handed three years, it’s not clear when Lowry’s shot will come as a middle man. As promising as Ehlers and Kichton are, there is a problem on the team’s left side that starts after Ladd, Kane, and Enstrom. Who can step in to that void is a central part of asking when the Jets will finally be competitive. Looks like you’ve got Josh as a lefty in the text and as a righty on the chart. I am pretty sure he is a lefty. I pray that these two young studs can replace Stuart and his horrendous/hideous/terrible contract. Worse contract next to Pavelec and on par with Thorburn’s contract.